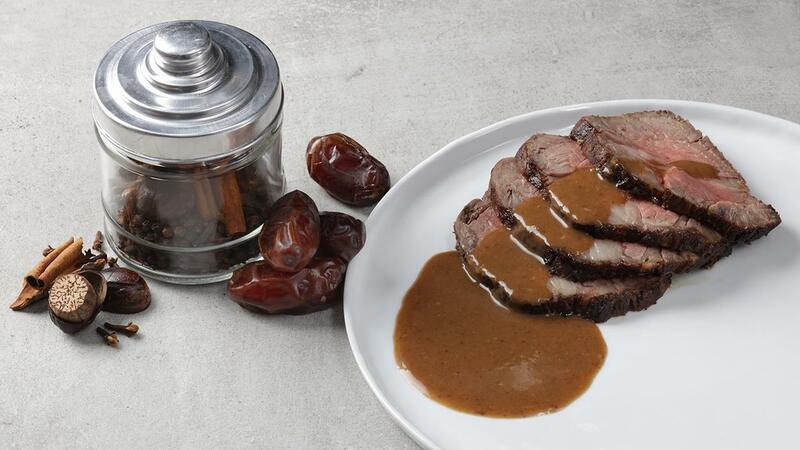 Britain meets the Mid-East in the Seven Spice & Date Gravy! Seven spice is traditionally used throughout the Middle-East and comprises of allspice, black pepper, clove, nutmeg, cardamom, cinnamon and dried ginger. All these spices go very well with roast meats. Dates round off the sauce with a light sweetness. View the full recipe below. Before starting the gravy soak the dates in a little warm water until soft, about 15min. Sauté onion in butter until golden, add seven spice and garlic. Prepare Knorr Demi Glace Base with water before adding dates, blend with hand blender before adding to onion mixture and finishing with cream.